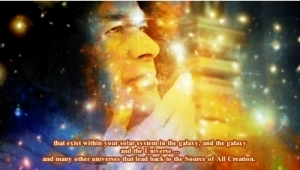 We call upon Cosmic Sai Baba to make his presence and we welcome his visit to us. ❝ It is I, Cosmic Sai Baba, and I am very pleased to be here today – it always pleases me to come and to speak to your gathering and I would like you to know that I appreciate the opportunity. So thank you My Dear, thank you. There has been a lot of upset, and it er … … is actually caused from the earlier sun and the revelations from the sun that comes from the fire that bounces around and sometimes flares to a point where Astronomers can see it very easily and it has been very active in the early part of the month of May. Those Solar Flares send out electric magnetic energy and it does find its way to your planet Earth. Because you are electrical beings it affects you and things around you. It affects everything on the planet. This is not readily taken for granted but … it is not always recognised by the mainstream people that live on this planet. And so it has been rather a time of difficulty for many people but I would like to announce that this time is softening and that the energy is being more calm now and people will not be stirred up so much. For it is the electromagnetic energy that does stir up the energy that is within your planet – and surrounding your planet. I would just like to say that all is moving forward – sometimes things are worse than others – sometimes things are much better – but if you look back and measure you would find that things are improving. This may not be readily seen or understood, but measurement can be taken of ENERGY and the energy is everything – I can assure you – all is energy. People and their breathing is energy – The planet itself is energy – in everything that happens upon the Earth is energy. And so this has different levels of measurement – and the measurement goes on to uplift consciousness – and this consciousness is raising. And so we are very pleased to see this, although it is difficult, I understand that. But please believe me when I say – The Earth is moving forward, it has never stood still and it is moving into the place where it is in alignment with a core of a suns – and this has already happened – and the energy itself from the Source of All Creation is helping to lift the consciousness of everything upon your planet. And elsewhere in the galaxy. So dwell on that – and be assured that things are moving forward and Peace will find its way here on Earth amongst all the people that exist on this planet. It will happen – it is coming – so please do not give up hope – allow yourselves to be human. By that I mean – nobody is perfect, but do not judge one another – understand that some make mistakes – some fall – but I want you all to rise up and know that from the Source of All Creation help is readily given – and all you need to do is to ASK. So with that I will take my leave – I would also like to thank all these people that have written to me – I send blessings to them and I have the message that I have just given to them. Please do not give up hope – all will take care of itself and RIGHT will be found upon this Earth. The measurement of the consciousness is raising – I have said this – but I want you to know that the consciousness when it raises to a level where all are at Peace with one another – a thought of a weapon – or the raising of a weapon – will not exist. It just does not exist in that level of consciousness. So be aware, consensus is starting to reign already upon your planet – and we are very happy to see your leaders directing the talks and the necessary reconciliation to take place for this to happen. So thank you My Children, thank you. God bless you, God bless you, God bless you❞.